This is an interesting and unusual theme for this debut novel by Ben Fountain. It seems Bravo Squad is involved in an especially intense and deadly ambush at the Al-AnsakarCanal in Iraq. Coincidentally, a camera crew from FOX News is imbedded with the unit at the time of the fighting and captures the battle on tape, including the Silver Star worthy heroics of one Specialist First Class, William Lynn. As the video appears on news stations throughout America, the men of Bravo Squad become instant heroes. The Bush administration, sensing the marketing opportunities presented by this display of visual heroism bring them back to the United States for a two week Victory Tour around the country where they are heaped with praise and worshiped as heroes. The culmination of the tour is a Thanksgiving Day football game at Dallas Stadium featuring “America’s Team”, the Dallas Cowboys and their effusive owner, Norm Ogelsby, who rolls out the red carpet for their heroic guests. Food and drink abound as the good ole Texas boys try and show their appreciation for what our young men and women are doing “over there”. They get to meet the Dallas Cowboy Cheerleaders. Billy even makes out with one of them and the two actually make plans to see each other when he gets out. Bravo Squad is even featured in the big half-time show starring Beyonce and Destiny’s Child. It’s all an unnatural blur to Billy and his squad. He can’t believe that after all of this they are headed back to Iraq in another day. It has been a whirlwind two weeks. Even Billy’s sister feels he has done enough for his country and tries to convince him to go AWOL. What Ben Fountain has accomplished in his tale of Billy Lynn and the men of Bravo Squad is to remind us of how little thought most of us give to those who make such sacrifices for all of us in foreign lands. We are a nation that can honor that contribution but only when there is a time limit on the celebration because there is a discomfort in having the notion of injury and death as a constant companion. Billy has a lot of decisions to make in a very short period of time. 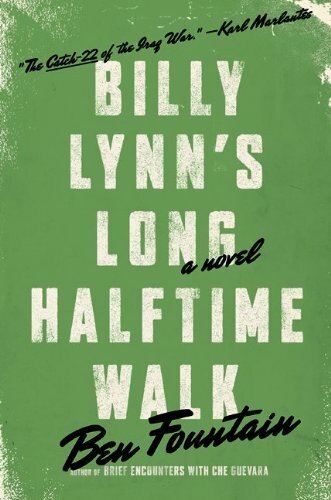 You’ll have to read Billy Lynn’s Long Half-Time Walk to find out the conclusion. I enjoyed the book and gave it **** stars.